NAIROBI, 23 January 2015 (IRIN) - The shocking satellite imagery of the destruction in the northeastern Nigerian town of Baga and nearby villages earlier this month provided graphic evidence of the extent of the crimes by the Islamist extremist group Boko Haram when they stormed in. The images released by Human Rights Watch (HRW) and Amnesty International on 15 January, which show clear signs of arson, ended a growing debate on media coverage of remote conflict zones. It turned the spotlight back to the fact that something terrible had happened in Baga, and hundreds, if not as many as 2,000 people, may have died. Josh Lyons is HRW’s remote sensing analyst. He worked on the Baga imagery, and says collaborating with investigators on the ground – matching testimony and local knowledge to what is observable in the satellite data - is key to the accuracy and credibility of his assessments. Computer software, with complicated algorithms and change detection models are usually needed to process and manage large numbers of satellite images. They can come in different spectral bands, including near-infrared – good for monitoring changes in vegetation health - as well as detecting evidence of fire damage, as in the case of Baga. New satellite systems use shortwave infrared to pierce clouds and dense smoke to reveal objects that would be hidden in traditional imagery – with resolutions as high as 31 centimeters per pixel. But what may look like classic damage signatures can be misleading under certain circumstances, and alternatives need to be painstakingly eliminated. Conflating events due to a lack of sufficient sequential time series data is another problem. 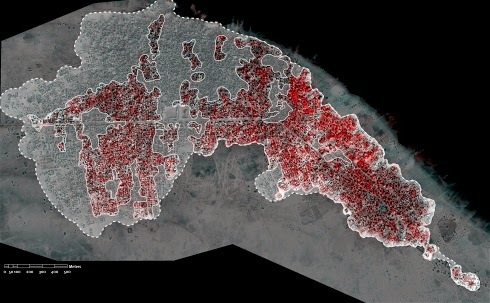 “It’s also very common that your mind’s eye becomes attuned to a particular type of damage, and you can miss other details,” said Lyons, who worked with the UN on remote sensing on Myanmar and Sri Lanka. - Check: To see if others have already tasked commercial imagery of your area of interest. Determine the date and time sequence you are interested in and the resolution required. - Order: The US firm DigitalGlobe has multiple satellites and its images are the most detailed, but the European Airbus company’s are less expensive and easier to order with a user-friendly online system. - Gather: As much ground-based evidence as possible – photos, testimonies, GPS references. Work with colleagues to cross-check information and investigate the initial observations. - Analyze: This can be outsourced. Accuracy is essential. Beware dangerously easy mistakes - post-harvest waste burning can look like impact craters under certain conditions. - Verify: Do your evaluation again and again to avoid tunnel vision. When the evidence is indisputable, launch your advocacy plan.